What Do We Do To Dishonor God? HomeBlogSpiritualityWhat Do We Do To Dishonor God? In his letter to the Christians living in Rome, Paul talks about people who attempt to live life according to a bunch of religious rules, that is, the law. The result is that God is disrespected, not so much by the people themselves, but by those on the outside looking in. In short, others harbor contempt for God based on how his followers act. However, this isn’t the first time this happens. Paul is actually quoting from the book of Isaiah. What Isaiah writes is not his words, but God’s. 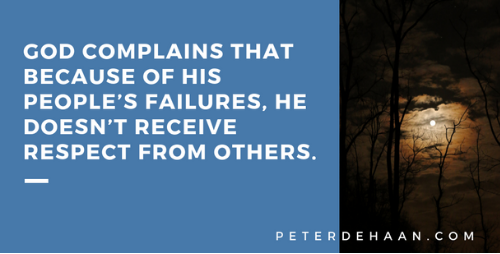 God complains that because of his people’s failures, he doesn’t receive respect from others. In both cases, the word the Bible uses to describe this is blaspheme. Others blaspheme God because of the behavior of those who claim to follow him. To blaspheme is to speak of God in an irreverent, impious manner; to disrespect, show contempt, dishonor, slander, or abuse him. I fear we have learned nothing from Isaiah or from Paul. Today we still do the same thing. We claim to love God, yet too often our words or our actions cause those outside of our faith to shake their heads in derision. They mock us and they disrespect God; he is blasphemed—because of us. We hate when we should love. We act with malice to those deserving compassion. We judge others even though we aren’t supposed to. We reject people on the fringes of society, the very people Jesus embraces. We are exclusive, even though God is inclusive. Forgive us God, for our blasphemy. You deserve better. I so appreciate your article… we are doing a study on respect for God with our “family study group” tomorrow evening . Your article just seals everything we have found and prepared for the class. I have almost harped on this topic for so very long, trying to get people to see that we are talking to the almighty when we pray to him and yet some feel it is okay to make a joke or flippant remark when talking to God. Perhaps I am old fashioned but I believe that calling him “Dad” instead of our Father when addressing him and making funny remarks about something when talking to him is so very disrespectful…. Dawn, I’m glad you liked this post. Thanks for letting me know.